The last Sunday in September is designated World Tiger Day. Here's a magnificent animal that really shouldn't need the publicity but, sadly, now needs it desperately. 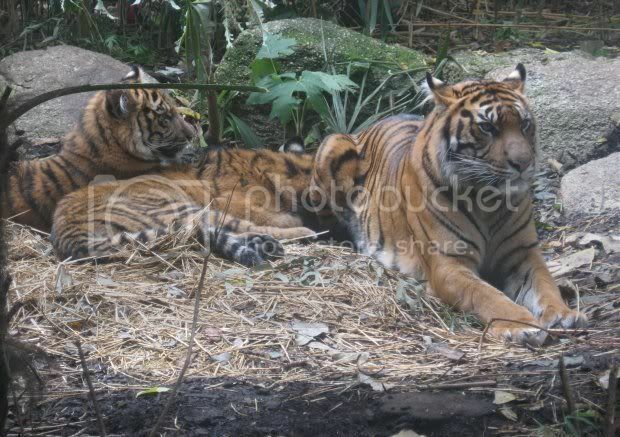 These are Sumatran tigers, photographed by Jill when we went to Melbourne Zoo back in July. The population there now is five, with the birth of three cubs late last year. I had planned to put up J and L's drawings from the same day (and may yet put them here if they turn up). The Sumatran tiger subspecies is well on the way to diverging into a full species, but with a surviving population estimated at 400, it is critically endangered. The usual pathetic reasons - habitat destruction, deforestation and fragmentation of populations, hunting/poaching for the production of (ineffective) medicines - are the main threats. The risk of extinction is very real, given the recent extinctions of the Bali tiger (1937), the Javan tiger (1980s) and the Caspian tiger (late 1960s), with the South China tiger soon to follow (allegedly 50-60 still exist in captivity only). 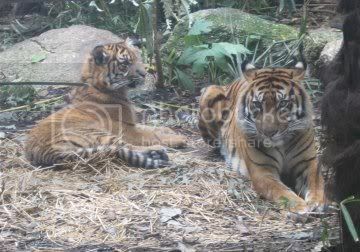 All currently existing tiger subspecies are Critically Endangered. There are many tiger conservation organisations out there. If you want to help and can't decide where to donate, the World Wildlife Fund is always a good place to start (we're members). Here's another in my series of posts about weird hobby number 973 - compiling animal album covers. There's such a glut of these lately that I'm having to divide them up into dragons, dogs, horses, reptiles, monkeys, etc. I may or may not get to post some of the others :). 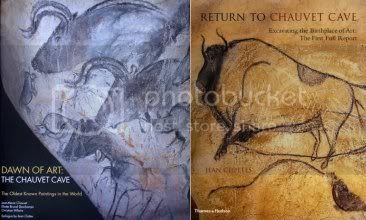 What's interesting here are some of the stylistic and thematic similarities occurring concurrently in a short space of time. 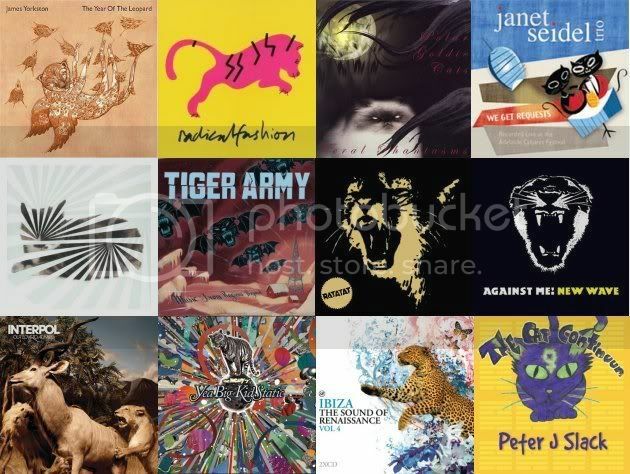 So here they are, cats big and small, all from recent CD covers (Click on pic if you want a closer view). Added note: Ben Lee liked Against Me's New Wave so much he made an acoustic cover of the whole album! You can find the tracks to download from Ben Lee's Blog (19th August). Last week J was in Perth playing with the school orchestra (touring around other schools over there). 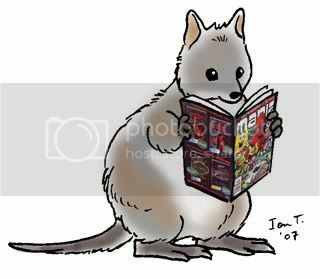 On Monday they visited Rottnest Island, home of quokkas, and Mania was even on sale there - cool! On Saturday night, we saw the Australian Ballet production of The Nutcracker which was done along traditional lines, amazingly staged and choreographed - I highly recommend this! The rats in particular were wonderfully done, and the shrinking down scene had to be seen to be believed (complete with lifesize soldiers in a box). J and L were transfixed, having never seen a ballet performance before (I figure this one is a good place to start). The second part of The Nutcracker tends to drift a bit for me as, in spite of the timeless music, it loses the narrative direction of the first half. This production maintained an ideal pace throughout. As we were first row in the balcony we had an exceptional view of the orchestra as well, but I was frustrated by not being able to see the (clearly audible) harpist :). Also on Saturday I went to the Post Office and picked up a box of old Colonel Pewter strips. They came in a biscuit/cake tin as the owner had collected them, 19 mostly complete stories cut from newspapers long ago, fairly yellowed with age and bulldog clipped together (some of the clips have rusted). I'll enjoy going through these! 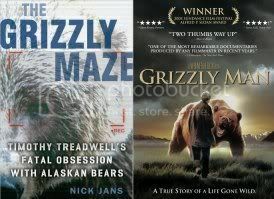 The latest Mania, #77 October 2007, is out now. This time I thought I'd feature a different page from the story - this is page 3. The gag grew through a number of drafts and it still works as a 2 pager without the last two pages. The 4 page version has a good ending but left room for me to play around with the middle of the story. For that reason, I could really space the panelling out on this page, even to having room to draw Moth and Tanuki whole and letting the backgrounds drop away to become backdrops. The dialogue reveals some of the dynamics of Moth and Tanuki's supportive codependency (something usually lost in the rush of the story). My major reservation was having large areas of flat colour - even though I matched it a bit on the facing page - but the pages came out really nicely in print. My main principle with M&T is no rules. If the story needs to work a particular way, visually or narratively, that's where I want to go with it. However, while this one is a downbeat story, it came out so well visually that it may influence how I do similarly paced future tales.